Sometimes I get a bee in my bonnet about something I want our kids to do. Last week it was having more structured responsibilities around the house (aka chores!). We’d been asking them to do certain things regularly, like set the table, but I was ready for some more predictability – and increasing responsibility. 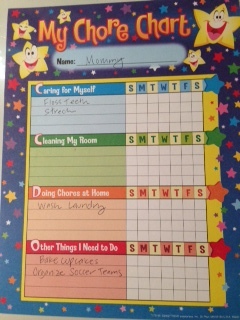 So I scoured various systems online, and found these paper chore charts to get us started. They come with stickers. Mr. six-year-old is highly motivated by this. Stickers! Fill up my list with stars! Mr. eight-year-old not so much. We’re on week 2. Let’s see if we can stick to this. This week my youngest asked me if I was going to do one for myself. Why not? I won’t list every responsibility I have around this house (that might be depressing) but it couldn’t hurt. And the good news is, you get a new list every week. So that to-do list doesn’t seem so daunting and endless. Second piece of good news, the list is short on purpose. No endless goal making that exceeds my capacity and makes me feel defeated. One of the categories on the chart is “Caring for Myself”. For kids, I think this means stuff like brushing their teeth. But what does “Caring for Myself” mean in my world – this week? Not next week, or later this month, but today, tomorrow, the day after. I realized that caring for myself is different from “treating myself”. I treat myself to an amazing cinnamon roll, but I may not feel so great when the sugar rush crashes. Caring for myself gives me more energy or peace, or nurtures a piece of me that’s hurting. This week, that’s my hips. They have been cramping up on me when I run! I keep saying that I’m going to stretch, but every night comes, and I think I’m too tired to do it before I go to bed. So this week, caring for myself means listing one simple thing that will address what ails me now. Today. What does “Caring for myself” mean for you this week? Post it in the comments! Step Into Growth Blog at WordPress.com.